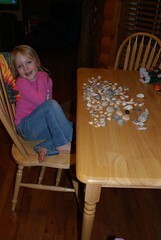 Grandpa Rice brought seashells back for Grace from Padre and she was thrilled. He talked to her on the phone while he was down there and she asked him to bring her some. She spread them all out on the table to get a better look. Lots of them had a tiny hole in them that will be perfect to make necklaces out of so she’s going to be the jewelry queen for a while.